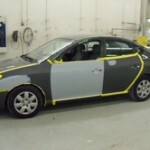 Full service automotive collision repair center, offering a wide range of services. Plus, we offer a Lifetime Warranty on all paint and body work! Collision 24 is a full-service car accident collision center proudly serving the communities of Brockton, Randolph and Stoughton. No matter what kind of service your car needs, we repair every make and model of vehicle and work with all major insurance companies to make sure that you get the best quality parts and service for your vehicle. For service they can trust, residents of the Brockton, MA region choose Collision 24. When you are in a car accident, you need somewhere to conduct repairs that will treat your car as if it were their very own, and that’s how we handle business at Collision 24. Accident collision services are easy to come by, but quality ones are rare. After an accident, you’re dealing with enough stress and worry. You don’t need it to extend to the service center performing repair work. Make no mistake: When you bring your vehicle to Collision 24, you’ll get repair services tailored not only to your specific make and model of car, but to the exact damage suffered. Your car will roll out of our shop looking and running like it just came off the lot. One of the toughest parts of working with a car accident collision center can be dealing with your insurance company. You needn’t worry about this with Collision 24, either. We work with all major insurance companies to ensure that you get the very best service, paid for to the maximum the policy allows. If you’re ready to get the best possible repairs for your car in the Randolph, Stoughton and Brockton areas, Collision 24 is ready to help. We are open six days a week, Monday through Saturday (Saturday by appointment only); view our service hours and schedule your appointment today.